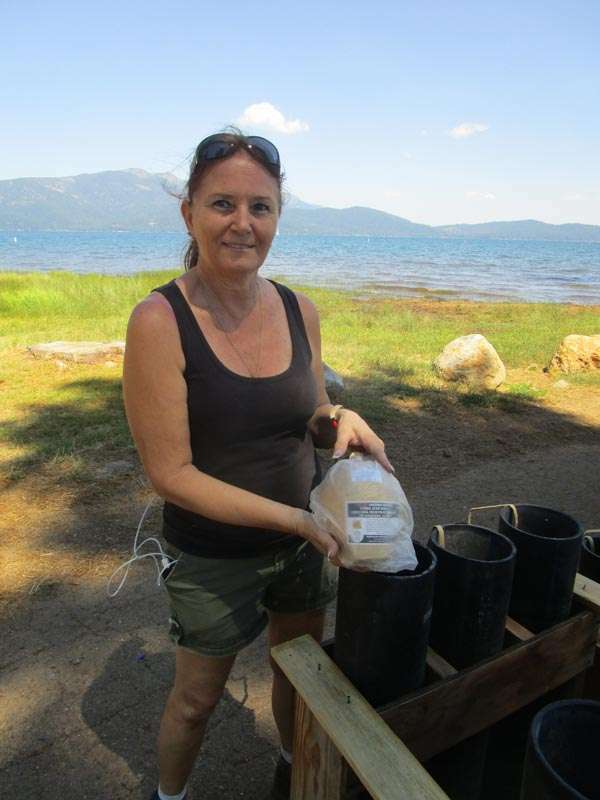 Licensed pyrotechnician Karen Blood shows one of the shells that will be part of the evening’s show. This 6-inch shell has close to a quarter pound of black powder at the base to provide enough lift to shoot it to the proper elevation. The top portion contains the bursting charge surrounded by various “stars” with different chemicals for color and design. In the June 20 edition of the Chester Progressive, the front page story titled “Chamber plans fireworks and more” related the history of the 40-year tradition of the pyrotechnic extravaganza over Lake Almanor. 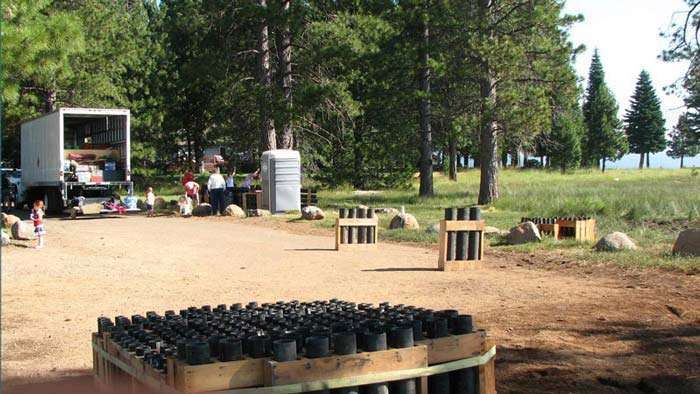 The original contract for the Lake Almanor Area Chamber fireworks display was with a company called Pyro Spectacular under the direction of Steve Souza. 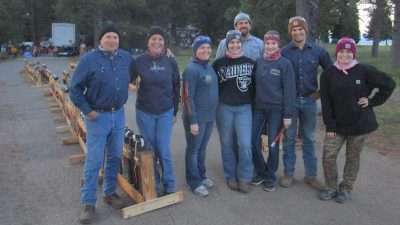 The family pyrotechnic team that set up and shot that display 40 years ago is the same team that set up and shot off the stunning display this year. That’s correct. 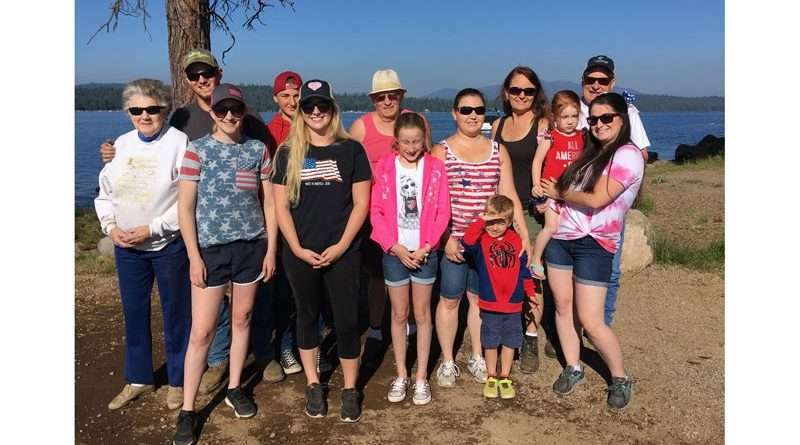 The Pierro family led by Norm Pierro has been serving the Lake Almanor Basin with pyrotechnic art for the same 40 years. The tradition for this family, however, goes back a little further in time. 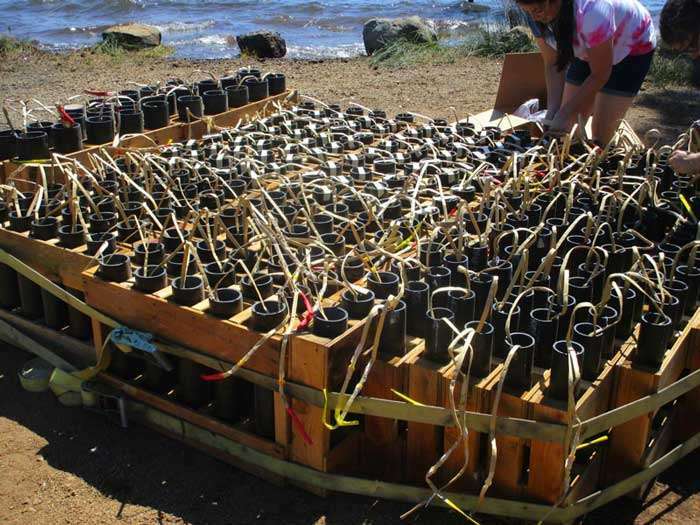 Pierro’s family immigrated from Italy in the 1920s where his father also had a fireworks business. After many years in the business in New York State, the family moved to California in 1946. The tradition continued with many members of the family, at least on a part-time basis, and continues to this day. When Steve Souza moved to J & M Displays West, the Pierros stayed with him and dedicated to Lake Almanor. Over 40 years, it is expected that many things will change. Kids grow up, get married and move out. We all get older, but some traditions are worth keeping. Pierro’s daughter Karen grew up, got married and now is Karen Blood. She is also the licensed pyrotechnician for the family. He also has another daughter that is in the business in Wyoming. This year, Norm Pierro had great-grandchildren watching the setup for the show and it was the first year he was not a part of the firing team. “Change is good, too,” he said. The family all works together to assemble the mortar racks and as they are completed place them in the proper location in accordance with the show plan. “It is hard to sit and watch as the kids fire them off, but it’s nice to watch what a good job they do,” he added. 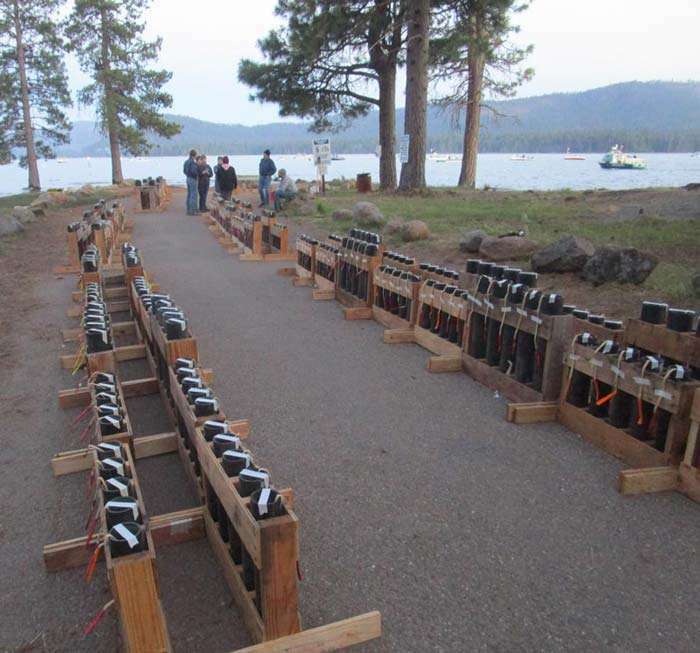 The setup alone for the Almanor show is an all-day process starting about 7 a.m. and ending moments before the extravaganza began with a couple of test shots to check the wind. 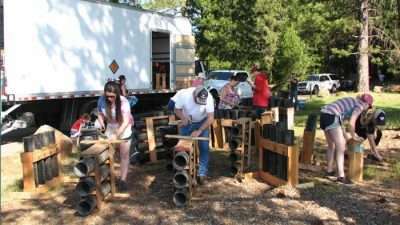 The unloading of a truckload of equipment and assembling the mortar tubes and stands is the first item on the agenda, followed closely with placing them in accordance with the show’s layout plan. This alone takes about half the day. Then comes the loading of the tubes with the shells and making sure all the fuses are correctly placed for quick access. Even with 10 sets of family hands for this process, it flows into the late afternoon. Everything checked and double-checked to ensure the safety of crew and spectators alike and then a couple of hours to catch a quick breather before another final check, firing crew don their safety items and those test firings to check the wind direction. A roar from the folks on the lake goes up when the first shot goes off. At 7 a.m., the family starts the process of unloading and erecting the many mortar racks that will eventually fill the space from the finale racks (center front) to where the truck is parked. About 20 minutes later, a second test shot soars into the air and another loud response from the waiting crowd. Everything is looking good with only 10 minutes to go. A final test shot, all is A-OK and the show begins. The four firing teams move methodically up and down the rows of mortars in an almost musical rhythm as they coordinate with each other. Earplugs are highly recommended for anyone in close proximity as the black powder shells are detonated. Then come the final two ignitions that set off the “cake boxes” and the grand finale display. Lighting those last two fuses starts an automatic progression of shells that include low elevation pyrotechnics that seem to spew from the cake boxes and the grand finale barrage of massive higher altitude star bursts, fountains, peonies, horsetails and various other types of shells. All that’s left is to clean up the site and have the fire department check the area for fire safety. Whether by blood or by marriage, this is one happy family as the four two-man teams are ready to get the show on the road, so to speak. There are only a few moments before the last test shot will be fired and the 2018 Fireworks Extravaganza will begin. By the end of the day, the line of mortar racks extend for many yards from the truck down to the finale rack on the far side of the firing crew. This is the time when all the double safety checks take place. Here is that grand finale rack with all 300-plus tubes loaded and fused in a continuous sequence. These shots, along with the “cake boxes,” will take what seems like an eternity to fire, but in reality it is only a few minutes. 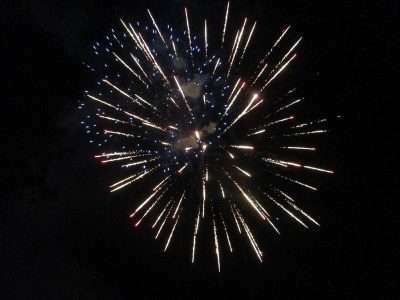 One of the best places to experience a fireworks display is up close and personal. One lesson this reporter learned is that the best location to take photos of fireworks is not up close or from directly beneath them. This is one of the better shots of what was a truly spectacular display.